LUPUS JOINT STIFFNESS can be minimized. You can feel the difference when moving between sitting and standing, say goodbye to serious stiffness! YOUR SKIN WILL BE TIGHTER & have a beautiful glow that sparkles and shines through a special formula that combines vitamin C and Bioactive Collagen Peptides® which are created using clean ingredients! DOUBLE THE AMOUNT OF VERISOL® Bioactive Collagen Peptides® than Sparkle Collagen Peptides Capsules: Clinically proven to boost the skin’s collagen levels by up to 60%, it includes nearly two times the amount of Vitamin C and the addition of Hyaluronic Acid. CLEAN INGREDIENTS: Non-GMO, gluten-free, dairy-free, soy-free, no artificial flavors. Plus, it is sweetened using Stevia. ONLY 18 calories per serving! DELICIOUS citrus flavor of orange or go incognito and use the “No Flavor“. I’m 61 and have been getting compliments on my skin! My grandkids tease me that I’ve had work done but nope! My skin is smooth, soft, bright. I love how much collagen this product has, it has way more than other products PLUS vitamin C! I’ve taken plenty of collagen supplements before but none that had the amount of collagen of this product. Most pill forms have around 500-1000 mg. This one has 5000 mg. Since it has vitamin C, I’ve saved money by reducing those supplements since it’s included in this one. It really is a great find! Thank you lupus health shop! Also, I think the apple ginger is amazing. it sounded like it was going to be strong because of the ginger, but it has a nice subtle note of ginger. I learned from the Japanese that collagen peptides are great for your skin and it’s best to start in your 20’s as that is when collagen starts to decrease. I’ve noticed plumper skin, less fine lines, and my shoulder joints are not as stiff in the mornings. Like a small decrease in stiffness, so hopefully it continues as I keep taking this. I bought the mixed berry flavor and it’s spot on in the description, it takes sooo good! I also think it’s such a great value because I can save money on other products since this has extra vitamin C, the right forms of collagen, and it helps everything that I need! Skin boost plus gives you faster results with skin tightening and really helps with the joints in less time! I’ve had the orange and it tastes pretty good, a little tangy. I think if I use less water it would be sweeter. Will continue to use, am happy with the results so far! it’s been 7 weeks and I can’t picture living without this stuff. IT’s so easy to become apart of my daily routine. I keep it at work incase I’m running late in the AM and keep one at home for the weekends. 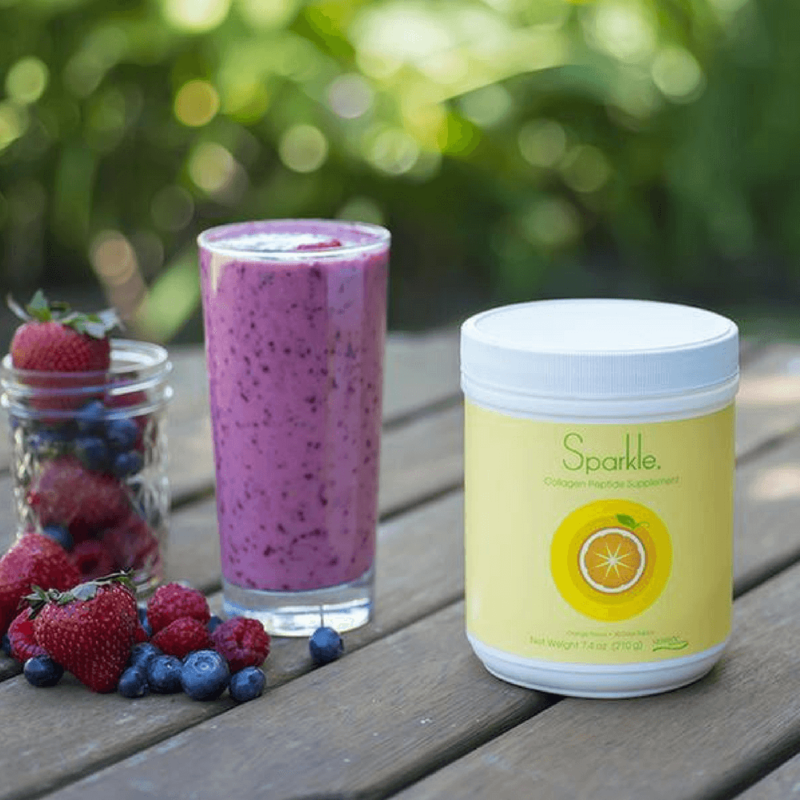 LESS PAIN and inflammation is possible through Sparkle’s Skin Boost Formula! 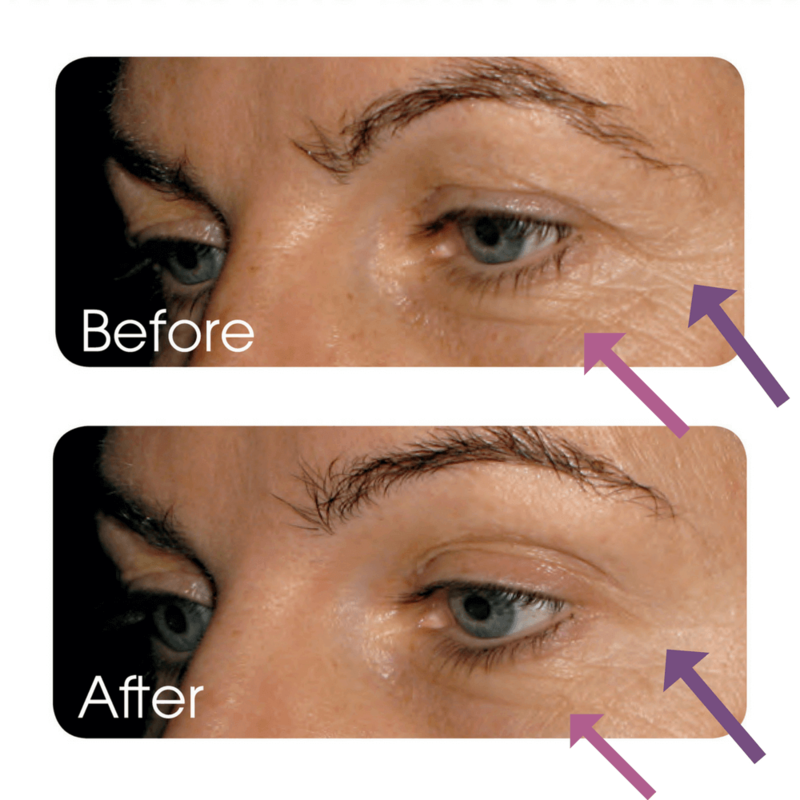 WRINKLES and fine lines can decrease in as little as a couple of weeks, noticeably decreased around 4 weeks! LUPUS joint stiffness can be noticeably minimized. It’s a great feeling to be able to move from sitting to standing without the stiffness! LESS PAIN and inflammation on your skin and in your joints is finally possible, plus an extra dose of vitamin C to help improve collagen absorption, feed your cells nutrients, and help support your immune system. What’s The Difference Between Sparkle’s Skin Boost and Skin Boost Plus? Compared to Skin Boost, in every serving of Skin Boost Plus, there is twice the amount of VERISOL® Bioactive Collagen Peptides®, that have been clinically proven to boost the skin’s collagen levels by up to 60%, nearly two times the amount of Vitamin C and the addition of Hyaluronic Acid. When collagen levels are increased, Lupus joint stiffness can decrease along with the pain! 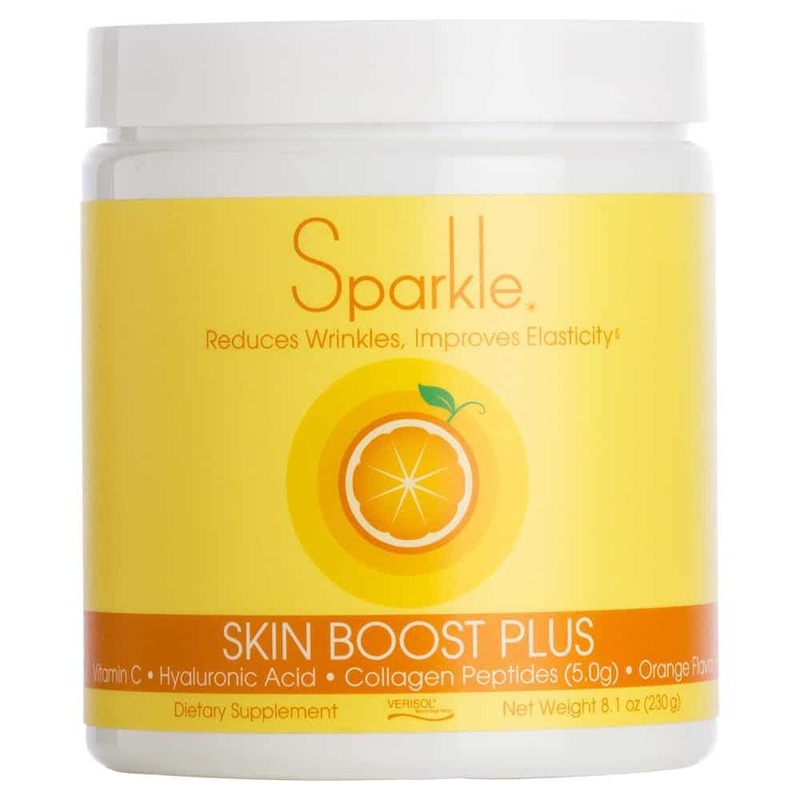 Also, Sparkle Skin Boost Plus delivers many benefits to your skin through the vitamin C use and Hyaluronic acid. For example, reducing the appearance of fine lines & wrinkles and improving skin elasticity, as well as improving nail health. Taken every day, Sparkle Skin Boost will have your skin looking and feeling healthy within weeks! What’s the Difference Between Sparkle’s Skin Boost Capsules and the Skin Boost Powder? There are only two differences; It’s in powder form and comes in various delicious flavors. Is It Safe To Take Extra Vitamin C? YES! Vitamin C is the BEST antioxidant for your immune system! When our body is constantly under stress and is in a weaker state, it’s recommended by functional medical and conventional doctors to increase your vitamin C intake when you’re sick or going to travel. This is a great addition to help fight the stressors that trigger flare-ups and inflammation. Collagen is the key structural component of cartilage tissue. Collagen peptides and its ability to support and improve joint function and joint comfort is backed by thousands of credible scientific studies. See “References” below! Collagen is the key structural protein that ensures your connective tissues like skin, tendons, ligaments, cartilage, and bones have elasticity and are able to go through regeneration. Basically, collagen is strong and flexible and is the ‘glue’ that holds everything together. It’s one of the safest and natural ingredients that are available in different grades. It can be found in foods, such as bone broth or gelatin-based desserts too. We know how crucial bone broth is for joint and brain health because of the collagen properties! What Does Collagen Do For My Body? Not only can it reverse the signs of hair loss, decrease wrinkles and put that glow back into your skin, it is a highly absorbable compound that increases joint mobility, flexibility, and strength. It buffers our bodies from shock and vibration from the amino acid Proline. Cardiovascular health is better supported and protected by the amino acid Proline. Proline is needed for tissue repair within the joints and arteries and it helps control blood pressure. It’s also linked with the prevention of arteriosclerosis (hardening of the arteries) since it helps our arteries stay clear of dangerous plaque buildup. Why Is Collagen So Important For Me? Maintaining adequate levels is essential to maintain healthy and flexible joints. When it comes to Lupus especially, collagen supplementation is SO important. Lupus can affect your connective tissue & joints quite easily causing damage, inflammation, stiffness, extreme pain, and immobility. Since lupus is a connective tissue disease(CTD), flares can occur because of environmental stressors like diet, allergies, or simply stress, plus overexposure to sunlight can be the trigger of inflammation and swelling! I’m sure you’ve experienced it if you have collagen vascular disease or connective tissue disease, bursitis and other chronic joint and ligament inflammation diseases. That’s why it’s so important to take preventative steps. 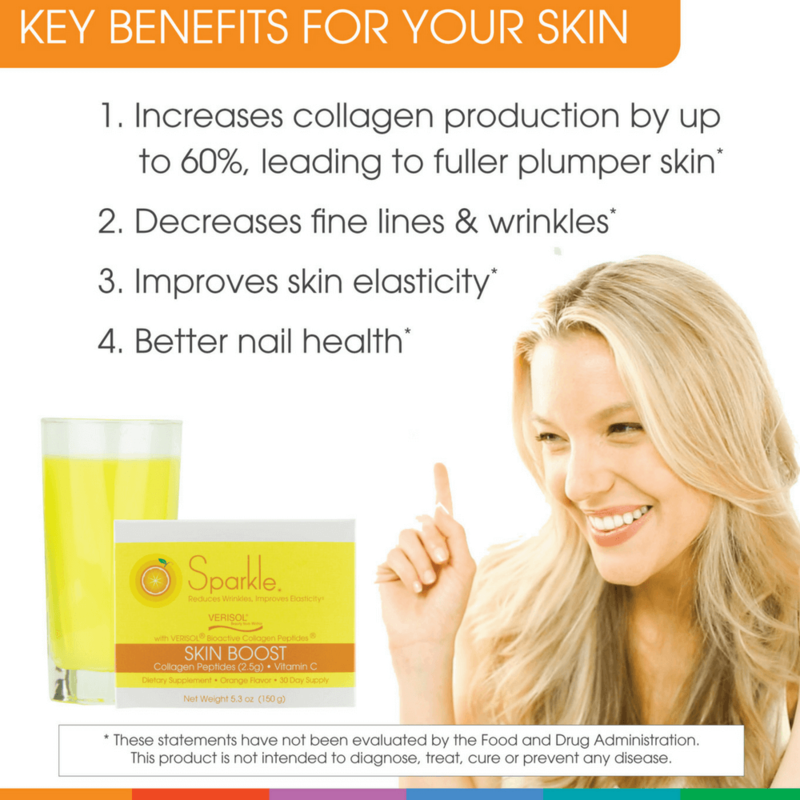 You can minimize the damage, pain, and discomfort with Sparkles Collagen Skin Boost Plus powder. Collagen Can’t Be Absorbed By The Skin. 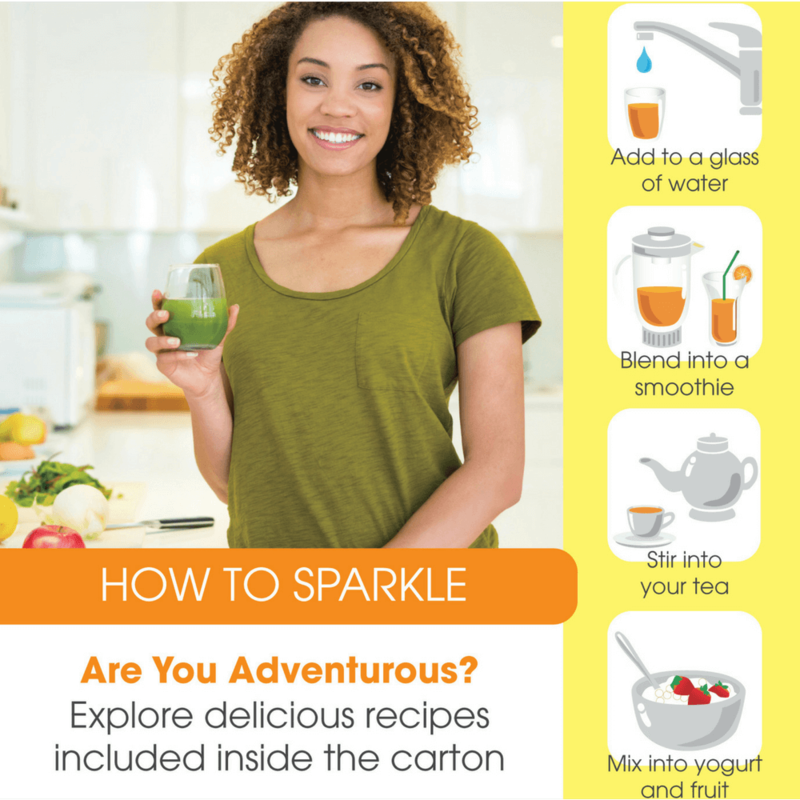 How Does Sparkle’s Product Actually Work? Since collagen peptides are too large to pass through the epidermis when applied topically, these supplements contain sub-molecules of collagen called collagen peptides. Collagen peptides are the building blocks that the skin uses to produce Collagen molecules within the skin. Not only that but, collagen peptides are a small enough molecular size to be able to be ingested by the body to then become available to your skin cells as the nutrients that your skin cells will use to produce collagen. A small family business that puts its consumers care first. They have won awards and have been featured in Forbes, ELLE, Yahoo, Examiner.com, The Beauty From Within, and many more. Sparkle doesn’t settle for the status quo. It took a few years to find a formulation with trusted sources of ingredients that are safe, nutritious and proven to make a positive difference! It’s a company that you will be proud to support as they have succeeded in their motto: beauty-from-within. Why Is Sparkle A Trusted Company? 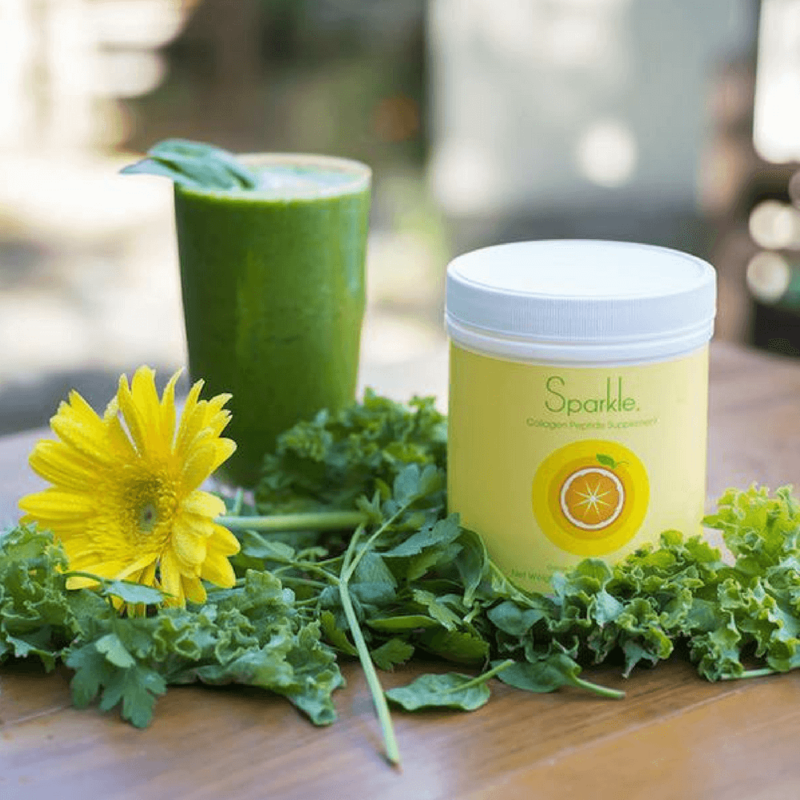 Sparkle was founded on the principles of ingredients matter, your health matters, and so does being transparent with customers! They’ve got the testimonials and clinical trials to prove it! How Long Will It Take For Me To See Any Results? Typically around four weeks, though we have been told that people see results much faster for the Skin Boost Plus powders. 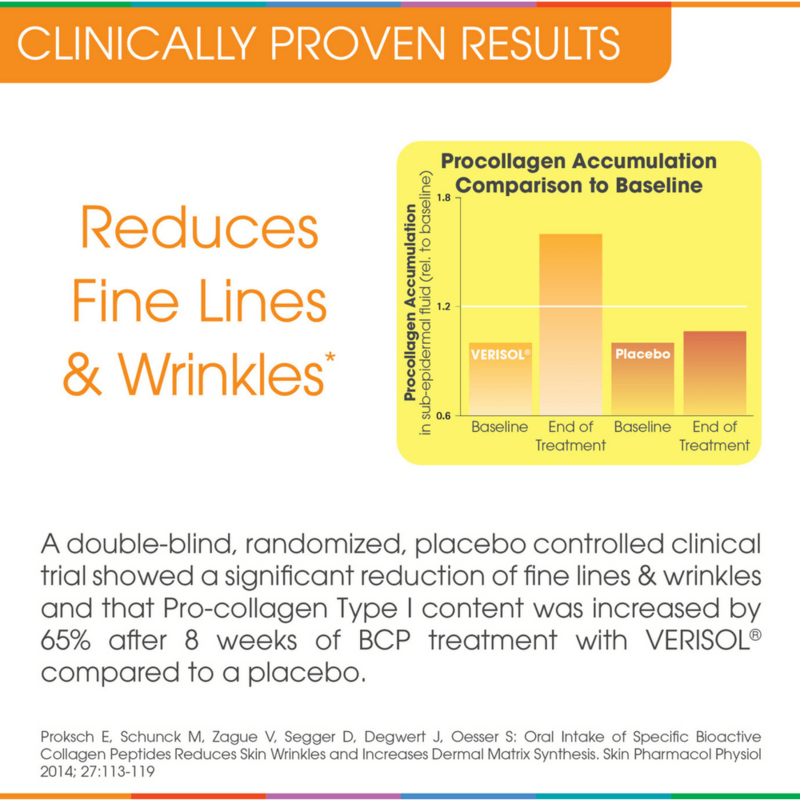 Clinical studies have revealed there is a significant improvement in skin elasticity, and reduction in wrinkles in the skin when at least 2.5g of VERISOL® Collagen Peptides are taken daily. 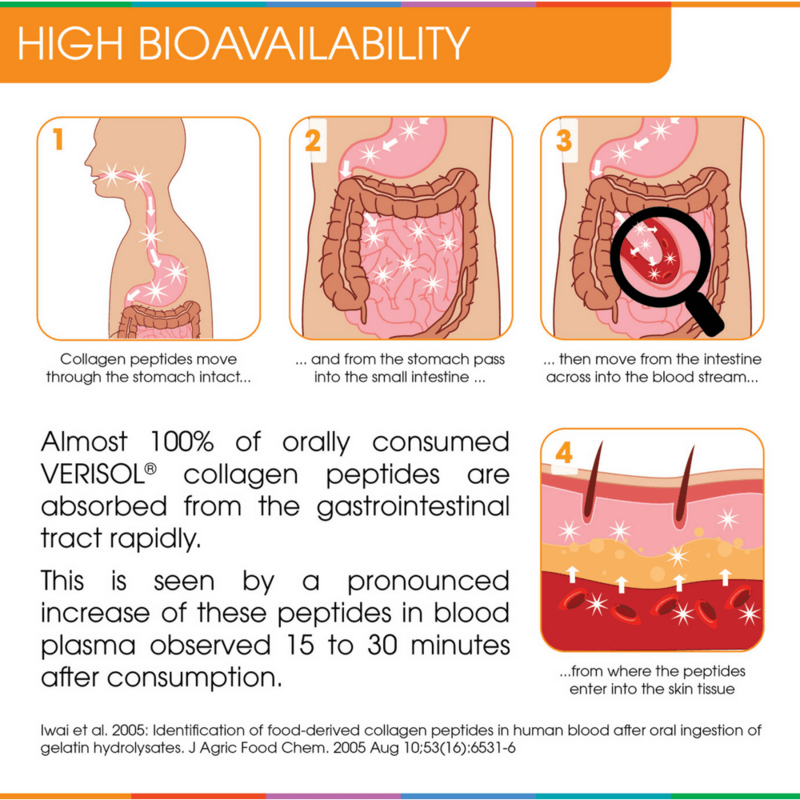 The clinical studies were conducted by Gelita, the manufacturer of the VERISOL® Collagen Peptides. 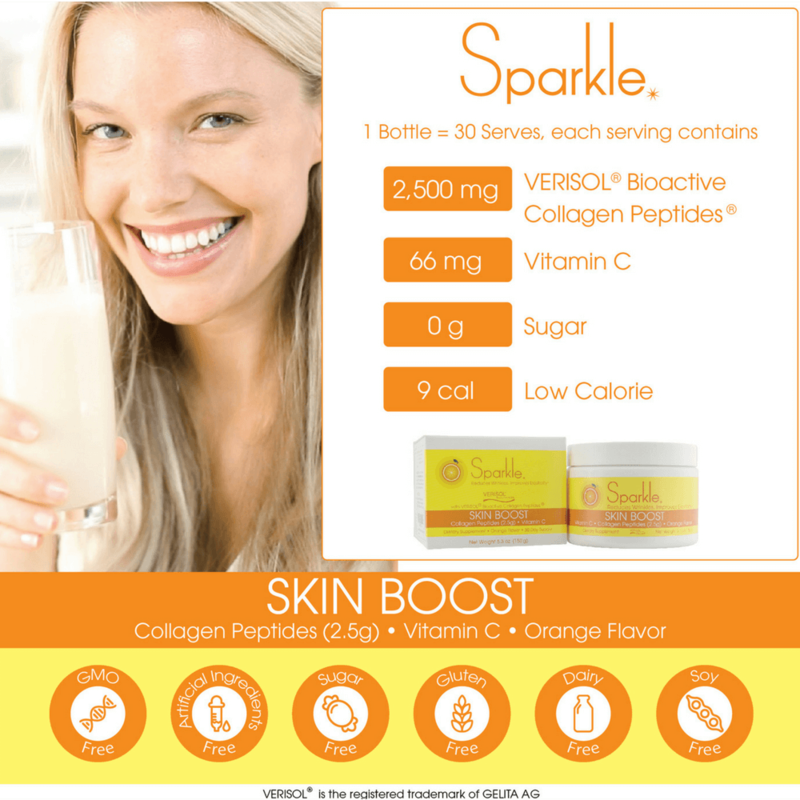 A serving of Sparkle Skin Boost contains 2.5g per serving, being the amount that was used in the clinical studies. A serving of Sparkle Skin Boost Plus contains 5g per serving, being twice the amount that was used in the clinical studies. When Is The Best Time To Take Sparkle? Anytime that works best with your schedule whether its the capsules or powder versions. For the capsules, we recommend taking all five pills at once in the morning before or after your breakfast so you won’t forget later in the day. For the powder versions, we recommend taking it in water, tea, or a smoothie with your breakfast first thing in the morning so you won’t forget later on in the day. Or, when mixed in water, you could also drink this as a tasty beverage on its own or with a meal. Who Ran The Clinical Trials and What Were The Results? The studies were monocentric, double-blinded, randomized, placebo-controlled studies. 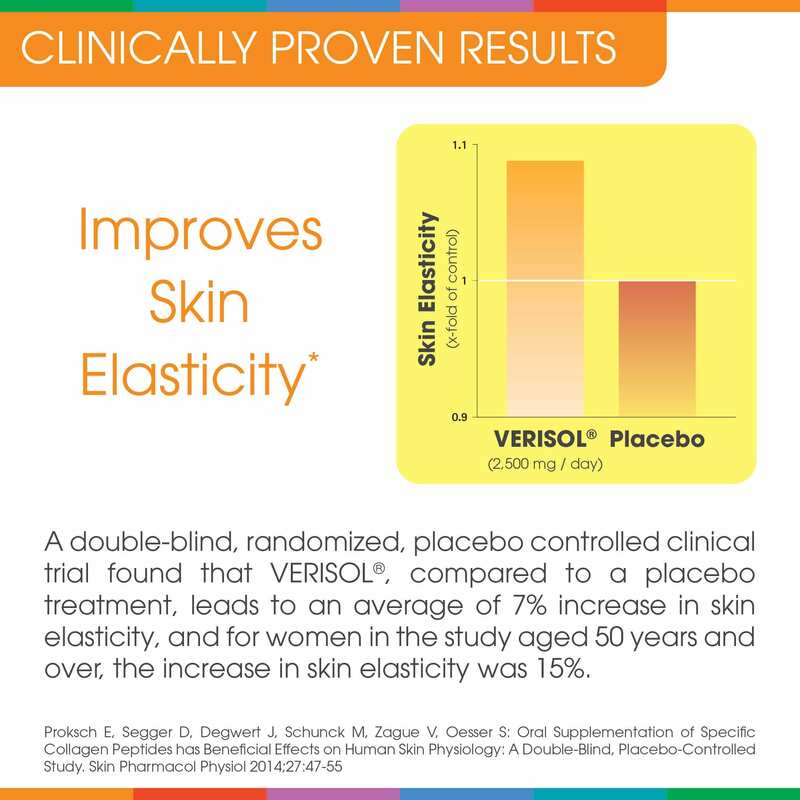 A study in higher skin elasticity was conducted with 69 women aged between 35 and 55 years old, revealed that VERISOL® leads to an average of 7% increase in skin elasticity compared to a placebo treatment. For the sub-set of women in the study that were aged 50 years and over, the increase in skin elasticity was 15% compared to a placebo treatment. This effect was measured after 4 weeks of daily intake and it was still the case when the women in the study were measured at 8 weeks and finally at 12 weeks. A second study was done on the reduction of wrinkles involved 114 women between age 45 and 65 showed that the daily intake of VERISOL® significantly reduced wrinkles after 4 weeks and the collagen in the skin increased by 60%. Mix one scoop (scoop provided) into water, smoothies or tea. If using ice, it’s best if ice is added after mixing. Can be consumed hot or cold. Mixed in food or a drink! You should take one serving spoon once per day, using the spoon that came in the bottle. Each tub of Sparkle ships with a serving spoon inside the tub. Note that serving sizes, and accordingly spoon sizes, vary from product to product, so you should always use the spoon that came with the product you are taking. Consistency is key to seeing the best results! Mix this powder with ANYTHING, hot or cold. It can go on food, smoothie, or mix with water for a tasty and refreshing drink throughout the day. PUT IN food or any drink, hot or cold. For example; smoothie, water, juice, tea. No Flavor: Perfect addition to any hot or cold flavored drink or food! A toxic-free way to reduce wrinkles, increase skin elasticity, and may help joint stiffness! Order, today for fast shipping.